"They've taken his wife. Now he's taking action." A doctor and his wife travel to Paris for a medical convention. At their hotel, they find the wife has mistakenly taken someone else’s suitcase from the airport. When he gets out of the shower, the doctor discovers his wife gone. The police are reluctant to believe anything serious has occurred, leaving the doctor to begin a desperate search on his own. Along the way, he encounters a young woman to whom the suitcase belongs and enlists her in finding his wife. They both realize the suitcase’s mysterious contents are something dangerous people are willing to kill for. 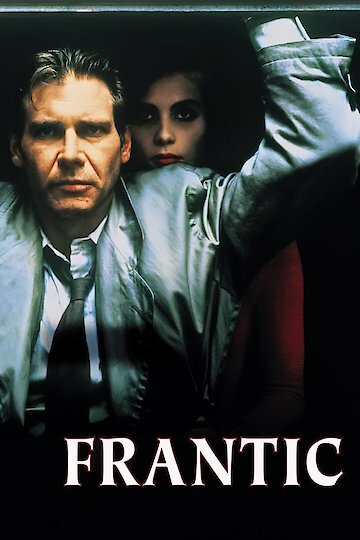 Frantic is currently available to watch and stream, buy on demand at Amazon, Vudu, Google Play, iTunes, YouTube VOD online.